This butterfly is free. In spite of the nuppiness, this is easily one of my favorite patterns. Evelyn Clark is a genius! Her patterns are always so well put together. 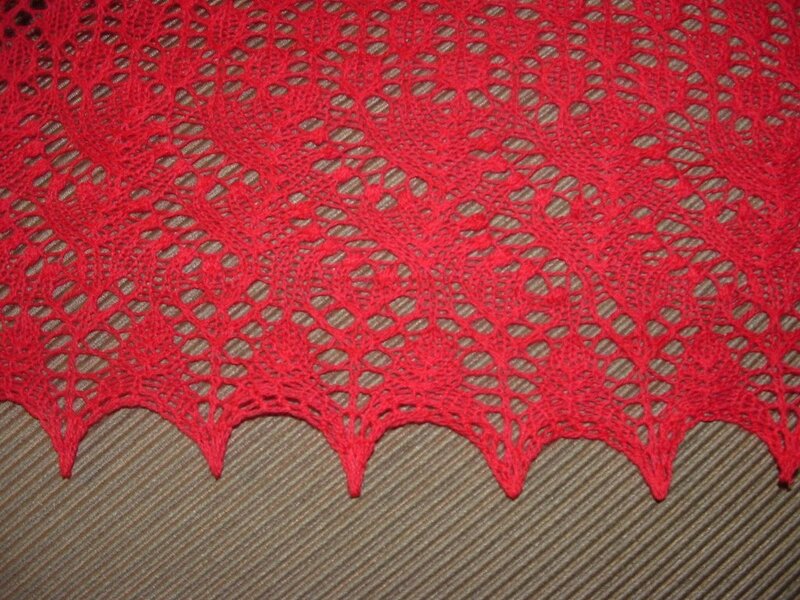 Take an easy to knit inner section and pair it with beautiful borders. The Lily of the Valley borders mesh perfectly. They were easy to execute, previous problems excluded, and took very little time. I will knit this again as more are already planned. I'm also fairly certain that I will never attempt a p5tog with a Holz & Stein needle again. 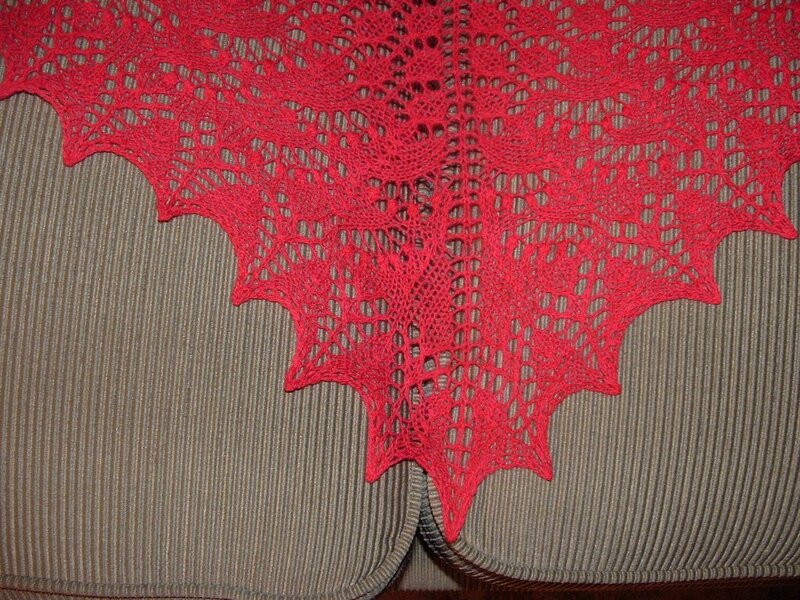 The tail of the shawl is another gorgeous detail. 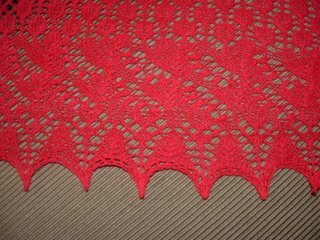 I will never cease to be amazed at the wonder of blocked lace. Even when you think you have the perfect idea of what it will look like, watching it bloom and spread from a barely recognizable blob is magic. 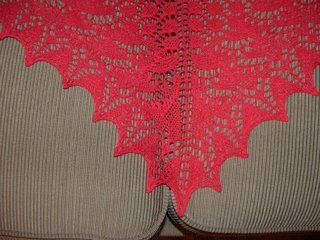 This shawl is for our next door neighbor of over 40+ years. The Kearses have looked out for and checked on us since we were kids. From the early days of shuffling 3 houses of kids back and forth in the big blue Buick to the swimming pool for lessons to the present. She's suffered heart problems in the past few years but this hasn't stopped her from looking out for and taking care of others. She's in her 70's and I enjoy her spunkiness, wisdom and wit. 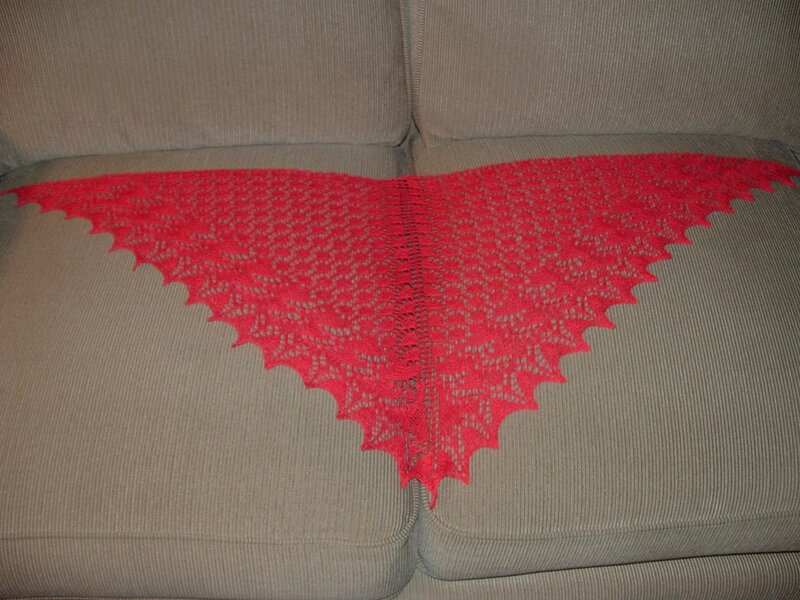 Going on up the WIP list is Pumpkin from A Treasury of Rowan Knits. It will be for Isaiah and at this time I'm stumped as to what size to make. He'll be 2 in October and is already moving to a size 4T! I started the size 4-5 but it looks to be way too big. It will be more than one color so I have to work the color scheme out also. Any and all tips are more than welcome. I'm used to knitting sweaters for the nieces, mom and sis. The poor nephews and brothers have been missing out on the fun for years. 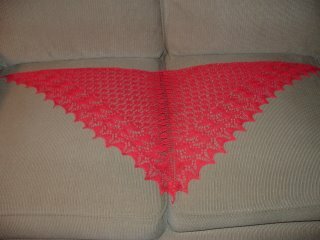 What a nice neighbor and she is lucky to have such a beautiful shawl. I looked that pattern over and hope to make it one of these days. The Zephyr is such a wonderful fiber. You have outdone yourself with this shawl. I'm sure your neighbor will be honored to receive it. Whatever you end up making for Isaiah, I can't wait to see the pictures! This is spectacular in this color!